Congress is poised to pass legislation that would launch a national discussion of the state of the federal criminal justice system. The FY 2014 omnibus spending bill was filed earlier this week after months of ongoing negotiations and is expected to gain passage quickly. One highlight of the pending legislation—the establishment of the Charles Colson Task Force on Federal Corrections—is to many inside the beltway a signal that the political left and right are finally willing to cast aside sacred political epithets such as being “tough on crime,” “three strikes and you’re out” and “lock ‘em up and throw away the key” in order to have a meaningful conversation on how to reform our nation’s broken criminal justice system. Facility overcrowding and ways to minimize future growth. Violence, including gang violence, in federal prisons. Prisoner rehabilitation and employment programs. Reentry programming and policies that reduce recidivism. The task force may also consider whether to replicate successful state strategies in the federal system and study victims’ services. 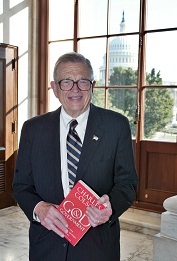 Colson, who died in 2012, was formerly a special aide to President Richard Nixon. Although Colson’s power and pride crumbled following his incarceration for his role in the Watergate scandal, his Christian faith was strengthened and he vowed never to forget the prisoners he left behind.